Responses to our September cover feature. I read Brick and van der Linden’s article (‘Yawning at the apocalypse’, September 2018) on the way back from a degrowth conference held in the European Parliament building in Brussels. There it was clear that most of the participants had not ‘got it’: If our species is to survive we have to radically change the way we live. Projections of our ecological footprint show that it would require three to five back-up planets for everyone alive today to live as we do in the West. What is more, the laws of physics relating to the conservation and interchangeability of energy and matter show that it cannot be done. If one consumes energy or material from any source, none of the resulting products, desired and undesired, go away. They simply show up elsewhere as such things as noxious gases or products that have to be disposed of in the soil, seas or atmosphere (including space debris). There is no such thing as ‘green energy’. The change that is required is as great as that from an agricultural to an industrial society. And just as no one in an agricultural society could envisage what an industrial society would look like, so no one in our society can envisage what a sustainable society would look like. There can be no blueprint. All we can do is set in train changes in the institutional arrangements (i.e. governance and financial arrangements) for the management of society which might lead to the evolution of an alternative society. And these comments apply with a vengeance to the thinking of Brick and van der Linden. Here we have a typical academic article driven by a backward-looking review of approximately 40 references (which were not included in the printed version of the article), which do not even include a reference to the 1972 Club of Rome report Limits to Growth or von Weizsäcker et al.’s 50th anniversary update (see critique at tinyurl.com/y7489kml). In point of fact climate change is only one, and probably not even the most important, indication of the urgent need to change our way of life. Tackling it on its own (and Lovelock and others have argued that it is already too late) would not yield the requisite changes because the effect would be overridden by the reactions of the rest of the system. Systemic change is needed. Amazingly, although the general population seems to be aware of this, psychologists seem to be remarkably blind to it. Indeed, if psychologists are to attend to these issues, it will be necessary to ‘turn psychology inside out’ in the sense in which Newton turned physics inside out. Before Newton, if things moved or changed direction it was because of their internal properties. They were ‘animated’. After Newton, it was mainly because they were acted upon by invisible external forces, which could nevertheless be mapped, measured, and harnessed. A similar reorientation in thinking is needed in psychology. I accept that climate change is a substantial challenge to the world at large and something on which psychologists should have something useful to contribute. I welcome the article by Brick and van der Linden. 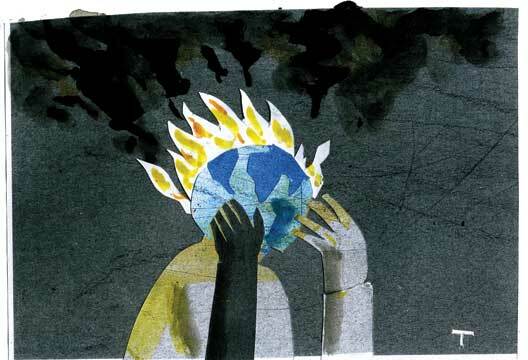 The term ‘climate change’ is used 26 times throughout their piece; however, to connect psychology with this ecosystem upheaval we must show that the world is going wrong for most of humanity and that it is we ourselves who are causing this. The article refers but once to the Intergovernmental Panel on Climate Change which has ‘reaffirmed the high degree of confidence in the role of human activity in driving climate change’ – and surely this ‘anthropogenetic mechanism’ calls out for a name, to identify it separately from the change itself – ‘human agency’? Brick and van der Linden set out three ways in which ‘climate change (can be seen as) ... a moral issue’, and three ways in which ‘we can promote social norms around sustainability’. So, we are offered six steps by which psychological expertise could help save the world. All the above seems to imply that there is one set of climate phenomena which is changing in a coherent way (i.e. global warming, but with local extremes of cold as well as of hot weather) and another set of human behaviour patterns which are ‘sustainable’ (e.g. less globalised, more local lifestyles bordering on the vegan) that should replace the unsustainable ones (e.g. driving internal combustion engines, eating dairy and meat). Along with the undoubted goodwill of the article, it may have offered some questionable assertions (see below) and have left a gap in what psychology could offer, to help the burgeoning world population live rewarding lives. The gap that deserves to be worked on is that of measuring human knowledge about ‘climate science and engineering’ and of identifying how better knowledge does, or may be brought to, relate with better behaviour. Though not in this article, one reads of the ‘carbon footprint’ as something we should minimise – as carbon dioxide released from burning carbon fuels is represented as bad, believing that all the CO2 released reaches the upper atmosphere where it blankets in the Earth’s warmth. Some CO2, however, is necessary for photosynthesis in plants, and it should be more widely understood what proportion is either ‘good’ or ‘bad’ footprint. (see tinyurl.com/yaqx7x5b for a discussion of this). Further, if green garden and food waste is diverted to rot, this produces CH4: methane – a more ‘powerful’ greenhouse gas than carbon dioxide. So, what might be the best management strategy for individuals and communities to adopt? To burn organic waste, or rot it? How well is accurate knowledge about this question, diffused? How many are well informed about the carbon footprint entailed in setting up a wind turbine, or in covering a roof with solar panels? How long would an appliance take to work off such a footprint, before it delivers the ‘clean energy’ which supporters like to talk about? The authors write that ‘climate change is often portrayed in the media as a future, distant, global, nonpersonal and analytical risk’, but is this true? Do they include amongst their ‘media’ the sites that people fill themselves (thus not ‘non personal’), or do they mean broadcasting and the press? These ‘output variates’ need to be measured, and it may well be found that traditional broadcasting channels have put a lot of emphasis on weather calamities and attributed them to global warming; if so, does immersion in such information influence people to want to behave more frugally? A very recent visit to the Arctic island of Svalbard was made by Caroline Lucas, a Green Party MP, who saw abundant coal mines (indicating times when forests grew there, overtaken by icy climates not thought to be brought about by human agency, though the current warming is attributed to such), and she said that the inhabitants there urged her to encourage the UK population to be more careful about energy use, the inference being that the nearby industrial nation would have more bearing on the remote climate of Svalbard (see tinyurl.com/y9lu93ul). This tricky problem of inference is something which research psychologists might tackle, given that small populations such as those of Norway or even the United Kingdom many find it unconvincing to support energy-prudence when one can see that massive Asian populations may not be being so careful. The ancient formula in psychology to study Knowledge, then Attitudes, then Practices I believe still has much to commend it. We feel encouraged by the diverse public response to our article, Yawning at the apocalypse: how psychologists can help solve the largest social dilemma in history. In October, the International Panel on Climate Change (IPCC) released a landmark report warning of imminent crisis. We must now pursue a wide range of mitigation and adaptation strategies, even with high uncertainties. This diversity of necessary actions is our central response to commentaries by John Raven and Mallory Wober (BPS, November). Wober commends more study before developing policy and behavioural prescriptions. Raven does the opposite, criticising our approach for being too modest. We agree that boosting recycling rates will not mitigate climate change, but that work forms part of a valuable whole. There are also research programs on the political consequences of collective discontent (link), when beliefs cause collective action (link), and on activism and radicalism in related fields like sociology. Revolutionaries could benefit from their findings. Taking immediate action to curb the effects of climate change – yes, today – can take many forms, from the incremental (eat less red meat) to the revolutionary (reorient society away from consumption and ostensibly limitless economic expansion). There is room in the tent for all approaches. Our fundamental research on the psychology of how people respond to climate change supports all levels. Complex economic and political systems are still made up out of people interacting with other people and the environment. As we debate the most valuable goals and best intervention methods, this fundamental psychology provides answers to the paradox of our informed inaction and illuminates concrete suggestions for action (see our earlier article). Note that the response by Wober may undervalue the firm scientific basis of the IPCC reports. The atmospheric chemistry is very well understood, as are the life cycle assessments for alternative energy sources. There are no policy panaceas, only bitter pills, but some are far more bitter than others (e.g., coal). Quibbling over well-established physical and chemical processes is a reason why systemic change has been so slow. Another key reason comes from maximising too much on the best possible course of action. From this desk, it feels like a tsunami is swelling on the horizon. Shall we spend more time talking about which hills are the most salubrious, or shall we run now? We are grateful to all readers and commenters, and welcome further dialog.